It’s been over two months since the Faculty of 1000 poster bank was announced. I submitted a poster, and heard nothing. This is starting to feel more like an advertising ploy to promote F1000 to targeted scientific societies rather than making a tool that is generally useful to scientists. I hope that I am wrong, and that the website will blossom. 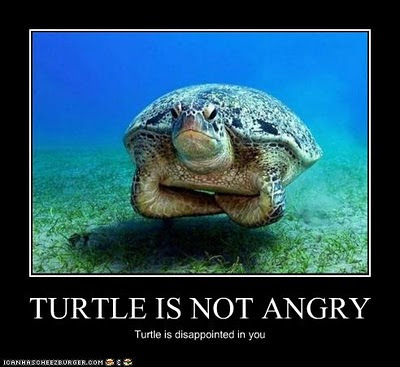 But as of right now, I’m with turtle on this one. Additional: See the comments for an update from F1000. What to do with the poster? I can certainly assure everyone the F1000 Poster Bank is not an advertising ploy but rather a genuine site that we are trying to build as quickly as we can but is currently a Prototype site. I am not sure what happened with your poster submission as I remember seeing you say on your previous post you were going to submit so I was personally on the look out for it but I never saw the e-mail. I therefore apologise that it hasn't appeared on the site. We have recently put up a simple online submission tool which removes the chance of any poster submissions going missing in the future and we always e-mail all depositors once the poster is live to provide the link to the poster so you do not have to 'hunt' for it. As I mentioned, it is currently a prototype site while we build the full site with smart viewing tools, full search capabilities and commenting functions. In the meantime, we have tried to flag everything up as 'Prototype' to make people aware it is a very basic site still, but we do recognise the importance of a search function and hence this is in fact the next thing we are adding. If you might be willing to resubmit your poster using the simple upload tool at http://posters.f1000.com/Index?page=Upload then I can make sure your poster is up there right away. Thanks for the input, Rebecca. I appreciate that these things take time to set up, but I guess I underestimated how much time. Two months can seem a veritable epoch in Internet time. Thanks Zen; I agree with you two months is a very long time and I can assure you we would never take anything like two months to get a poster up once we have received it. The only explanation I can think of for your poster not arriving is that if the poster file is too large for the e-mail system (which is the approach we were using right at the start) then the e-mail doesn't arrive but you don't receive a delivery failure notice either, leaving you assuming the e-mail has been sent safely. With the new submission system, this should not happen. We currently aim to get all posters up live within a couple of days, and once we have the full site built, unless there are any queries on the poster, they should go live almost immediately.